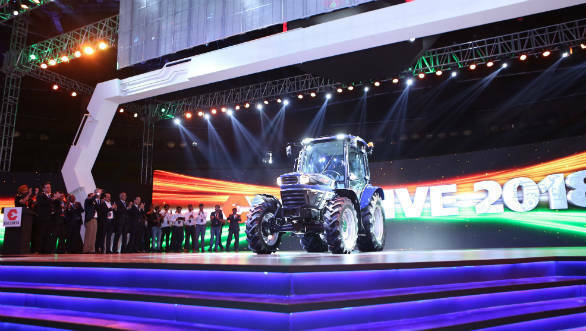 The Escorts group today showcased its Automated Concept Tractor at its annual innovation summit, Esclusive. This concept is the first step towards a larger automated farming solution that the company also announced. To this end, Escorts has partnered with tech giants like. Microsoft, Reliance Jio, Trimble, Samvardhana Motherson Group, WABCO, Bosch and AVL. The comapny hopes these partnerships will help it develop a range of farm machines with electric transmissions, autonomous applications, remote vehicle management, data-based soil and crop management, and sensor based guided farm applications. The aim of this initiative is to bring more mechanization to Indian agriculture which will in-turn increase farm outputs and consequently farmer income. Escorts is working with AVL for electric driveline technology, with Trimble for sensors, controls, water level management system and automated e-steering. With the Samvardhana Motherson Group, Escorts is working on smart interface cabins and care plus which is a two-way voice interface for real time service. WABCO will help with vehicle controls and automation technology and Microsoft will provide its Cloud & AI technology enabling precision agriculture capabilities to help farmers make informed decisions and get more returns from their farms. Bosch and Escorts are working on future emission readiness and with Reliance Jio for enhancing farm machinery life cycle with networked platform providing top-notch service and genuine spare parts across the country. Escorts also debuted Escorts Crop Solutions, a platform for shared services and agri solutions. This will provide end-to-end, state of the art equipment for paddy farming under a pay-per-use rental model. Other announcements include a service platform to aggregate farm equipment owners to rent out their equipment to small and marginal farmers(Traxi), genuine parts and skilled service at an affordable price(Smart Parts), as a front-end farmer interface for agri inputs and customized agri information(Digitrac), and a system to provide advanced implements and equipment for efficient and productive farming (Farm Power). The Indian agricultural system is plagued by issues such a low yield and low levels of mechanization. This initiative helps address these socio-economic issues using technology that is already present in the broader spectrum of the auto industry.